Question: Where are the steps for a basement located? 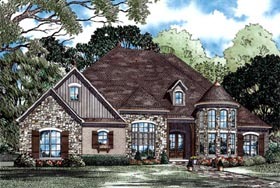 Answer: Thank you for your interest in our home plan designs. The sq ft of main level heated and cool is 3052. The bonus above the garage is 626, garage 1114 and porch 457.